Nick Anthony: Let’s welcome ‘The Fallen Angel’ Christopher Daniels to the show. Ian Riccaboni at All In called him ‘The Living Legend’ and dude I like it, you are. 20-25 years or so in the industry. A few names come to mind dude when you think of Living Legend. You know the past Living Legends we know about them, but nowadays you think of The Miz of course with how far he’s come in his time and you man I mean damn, you’re a Living Legend. Christopher Daniels: Well, I mean wow that’s very nice of you to say. Yeah man, I’m just fortunate to keep going after 25 years and still going strong so far. It’s not up to me to say Living Legend though, I mean if you guys say it I’m not going to argue, but yeah man it was nice of Ian to give me that and what do you say to that you know. Anthony: You just keep moving man that’s all you say. Living Legend man I love it. You’re here for Death Before Dishonor and we’ll get to that, but lets knockout All In in Chicago first. 11,263 or something like that, that wrestling fans, the numbers just keep coming out today from FITE TV and Starcast. It was beyond a successful show for everyone who participated. You and (Stephen) Amell put on a damn good match. I can’t for the life of me how anyone else can view it as anything, but a success. Daniels: Yeah, absolutely this was above and beyond what even Cody and The Bucks had envisioned when they talked about putting this show on. I mean they were looking to fill 10,000 seats, they got 11,263 like you said and in the end, for that weekend it was the destination for millions of eyes for the wrestling world to watch and I was proud to be a part of it. Anthony: I asked the listeners earlier in the program if independent wrestling is more relevant then it’s ever been now and what you contribute to that, what’s your thoughts on that? Daniels: Yeah, absolutely think independent wrestling is more relevant now than ever just because I feel with the reach of the internet and the ability to see different promotions around the world whether it’s through New Japan World or Ring of Honor’s Honor Club or The WWN Network, there’s so many options for the wrestling fan that don’t involve WWE. So yeah and as good as WWE is you know for some people that’s enough, but for other wrestling fans they want a wider variety, they want different stuff so now there’s so many different avenues that a wrestling fan can take to scratch that wrestling itch that you want and so much of it now is what people qualify as independent wrestling so yeah that’s where we are right now in the wrestling world. Anthony: And of course competition only makes things better whether it’s independent or mainstream, competition always makes both sides better as you try to out-do, out-perform, get better ratings or whatever you want to say. Competition makes things better. It was an amazing show, an amazing card and I’m only hoping there’s more in the future. I know the boys are even talking about it, they’re going to take a break, but I know it’s in their mind because they want is there. We want more so you guys got to give us more dude. All right Death Before Dishonor Las Vegas Nevada, September 28 at the Orleans Arena. Dude you want to know something I didn’t even realize until I started looking into this more. You and Kaz only were in action with The Briscoes 4 times, as long as you guys have been wrestling, both teams, 4 times that’s unbelievable to me. Daniels: Yeah we never had an opportunity, The Briscoes have been in Ring of Honor since the very beginning, they stayed there the entire 16 years of Ring of Honor’s existence, and Frankie and I didn’t become a team, we didn’t become part of Ring of Honor until 2014 and then over the course of the past 4 years we’ve only had those matches that you talked about so you know for a period of time Jay was Heavyweight Champion for a period of time I was Heavyweight Champion and we just never really crossed paths that often, but now not only are we crossing paths, but it’s for the World Tag Team Championships so everything is on the line at Death Before Dishonor. Anthony: You and Kaz seem to have clicked into this tag team forever role and in my opinion, you guys are just joined at the hip over 5 years or more. You guys aren’t brothers like The Young Bucks or The Briscoes for that matter, you don’t see longevity like this anymore, for the most part, do you? Daniels: No not really. I feel like in some places certain teams are split up because they feel like there needs to be fresh ideas and done, but for me and Frankie we never saw the necessity of splitting up and having a feud, we felt like we still had stuff to offer as a team and when we went our separate ways as far as doing singles stuff we were content to come back together as a team. I think part of the reason for that is we didn’t start out as a team, we’ve been friends for over a decade and we had our own singles careers before we became a team so we feel very comfortable being apart from each other, but we don’t see the necessity to get into a long drawn out feud when we can keep our options open and split off and do what we want to do singles then return to the team scene. Now with Scorpio Sky as part of SoCal Uncensored that even adds another facet to our game. I mean if you look at All In Scorpio and Frankie one of the few times they tagged together as a team and they got the victory over The Briscoes so there’s all kinds of possibilities, for opportunities for me, for Frankie, for Scorpio & the three of us as a trio as well. Anthony: One of the greatest storylines in professional wrestling, in my opinion, is when tag teams break up and when you guys break up that’s going to be something to see. I’m not hoping that it does, but it’s one of the greatest storylines so I’m sure it’s going to come up at some point. Daniels: Probably not. Don’t hold your breath for it man I don’t see Frankie & I splitting up. We’ll be the team just like Ricky Steamboat never turned heel, we’ll be the team that doesn’t split up. Anthony: With what’s going on with Koff in ROH where you have to win the Championship or title or you won’t get re-signed to a contract it has me thinking a little bit dude. Are you thinking about wanting to slow down a little bit or something, I have to ask the question are you considering doing other things in the industry? Daniels: I mean I’ve always thought about it. There comes a point when we won’t be able to do what we’re doing, but I don’t see that time coming for me. I feel like at this point in my career I’m wrestling I’m still at that top level where I can get in there with 10 years younger than me or even more and still put up a competitive match. So there will come a point where I will look to transition into commentary or transition into something behind the scenes, but I don’t see that happening right now and it’s not so much about winning a championship to keep our jobs it’s convincing Joe Koff that the best thing for ROH is to keep Christopher Daniels and Frankie Kazarian, and I mean some of our actions in the past have cause Joe to think that it’s better that we part ways, but we’ve got another 4 months to convince Joe that ROH is better with us there and said one way or the other even if Joe decides it’s better for us to part ways I’m going to do everything I can to leave ROH better than I found it and Frankie and Scorpio feel the same way and we’ve turned our attitudes around and we’re trying to be better wrestlers and better team players and hopefully that convinces Joe to offer us new contracts at the end of this year. Anthony: One of the Founding Fathers way back in 2002 at the Murphy Rec Center, that seems like such a long time ago, did you ever believe that ROH would be as huge as it is now, you’re selling out Madison Square Garden in 2019 and again like All In within minutes, not one damn match is even on the card yet dude. Daniels: Yeah I mean we had no idea that first year or so the extent the longevity of ROH was going to be, but over the years we’ve seen rise come and go, we’ve seen success stories of guys that left ROH, but whenever talents leaves ROH another talent that rises up in their place and I think that’s one of the saving graces for ROH it’s become a destination for guys to sort of break out and be seen on a national level. That’s the sort of thing that keeps a company going is that revolving door of talent. Guys grow to the point that if they have leave that’s fine because there are other guys that are ready to step up and take that opportunity and there are so many people that are getting their first taste of national stardom in the ROH ring that’s what keeps ROH fans keep coming back is seeing new guys come in and seeing talent like myself and The Briscoes and Jay Lethal who’ve been there for such a long time and interacting with these new guys and watching talent grow to the point it all makes ROH stand out on the wrestling landscape. Anthony: Jay Lethal’s my guy man, I love Jay Lethal, but listen with the statistics, numbers, and ratings like we see. Sell-outs and what have you, can we or do we consider ROH the “independent promotion” like a RevPro or CHIKARA or PWG because, in my opinion, it’s a major destination promotion much like IMPACT! and NJPW. Daniels: Yeah I feel like when ROH became, essentially when Sinclair bought ROH and started a television show I feel like independent wasn’t really the right term to describe ROH and you can say the same thing about TNA once they got a national television show, but for a long time there really wasn’t a level between WWE & independent wrestling, so I feel like companies like TNA and ROH filled that gap and WWE’s been around for so many years now they’re the gold standard of success in professional wrestling, but for the past 16 years ROH has kept a steady uphill climb of popularity, of success and it’s like you said in 2019 now they’ve sold out Madison Square Garden. 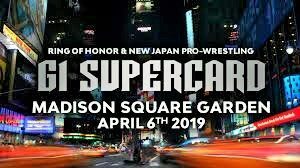 It’s more growth like that, that keeps ROH as a destination for young wrestlers to come in & be seen on a national scale, it’s that sort of growth that has us going into bigger arenas in 2019, more markets in 2019 and just more growth for the company overall. Anthony: Low-Ki has rumors that he’s impatient, he hates losing, he thinks too highly of himself. You’ve been around him a long time, you were there with him n the beginning for both ROH and TNA so can you tell us what is fact and what is fiction when it comes to this reputation that Low-Ki has gained over the years? Daniels: Well I can’t really comment on Low-Ki’s interactions with promoters whether or not he’s told them I’m not going to lose or I refuse to put guys over. All I can tell you is whenever I’ve worked with Low-Ki he’s been nothing of that sort with me, he and I have a very healthy respect for each other, we’ve had an opportunity to work in ROH, in TNA, on the independent scene and I feel like he’s very talented, he’s a guy that sticks to his principles, sometimes that rubs promoters the wrong way and that’s certainly Low-Ki’s prerogative to have his principles and stick to them. If that has called dissent among other promoters that’s something that he has to deal with, but it seems to me that’s something he’s ok to deal with because he’s been successful wherever he’s gone currently right now the MLW Heavyweight Champion so you can argue whether it’s hurt his reputation or not, I’ve never seen that side of Low-Ki myself so I can’t really comment on it with any sort of intelligence. Anthony: In an interview from 2003 you mentioned the priest robe you wore, you borrowed it from a priest friend you knew, but you never gave it back. Have you returned that yet? Daniels: Actually I don’t remember the actual church I borrowed it from so I still have it. However, if they priest I borrowed it from is listening today he can contact me through email or twitter and I’ll be happy to return it because it’s hanging in my closet in a place of esteem. Anthony: You know stealing from a priest has some, I mean come on that’s got to be. Daniels: Well it’s not stealing, it’s still borrowing I haven’t decided to keep it forever yet. It’s just a matter of finding me, sir. 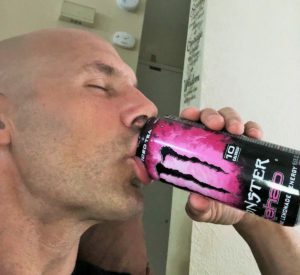 Anthony: What’s with you and this monster pink lemonade I see on twitter? Daniels: Monster rehab the best flavor out there is pink lemonade, but for some reason they’ve started to dry up I’ve been forced to buy peach tea flavor which is not my favorite flavor, but it is the lightest one, the closest one to pink lemonade I can find so if there are any fans out there that have pink lemonade monster rehab you can ship them to care of Christopher Daniels to ROH’s offices & I will repay you with a picture of me giving you a thumbs up. 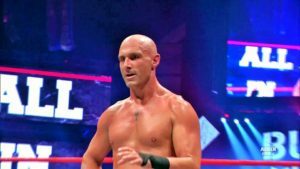 Anthony: Christopher Daniels and Kaz – The Addiction facing The Briscoes only for the 4th time ever, crazy to me still, for the ROH World Tag Title belts. 9/28 in Las Vegas NV at the Orleans Arena also that weekend at the Las Vegas Fight Shop the two will be appearing, SoCal Uncensored – Daniels, Kaz and my boy Scorpio Sky will be in Long Beach CA for the Long Beach Comi-Con 9/9, that will be fun, fun all-around, big fun. Daniels: Absolutely man Long Beach to Las Vegas we’re making the tour, we’re bringing that SoCal love everywhere we go even to the worst towns we’ve ever been in. Anthony: Christopher Daniels you said it, you said it all my man @facdaniels on twitter also at ROH there he goes. Thanks a lot, dude.